The Deliverers and the Arm Master are a list addition I'm toying with... it's going to be probably either them or Zealots with a Monolith Bearer. My goal for next month's meeting is to run TOM with both these ideas and deciding which I'm going to go with. The next meeting for the Fukuyama Gaming Club will be on February 11! Come play! Also!!! and this is exciting... some of our good friends from the Iwakuni Air Base are currently at Bally's Casino for the Las Vegas Open. 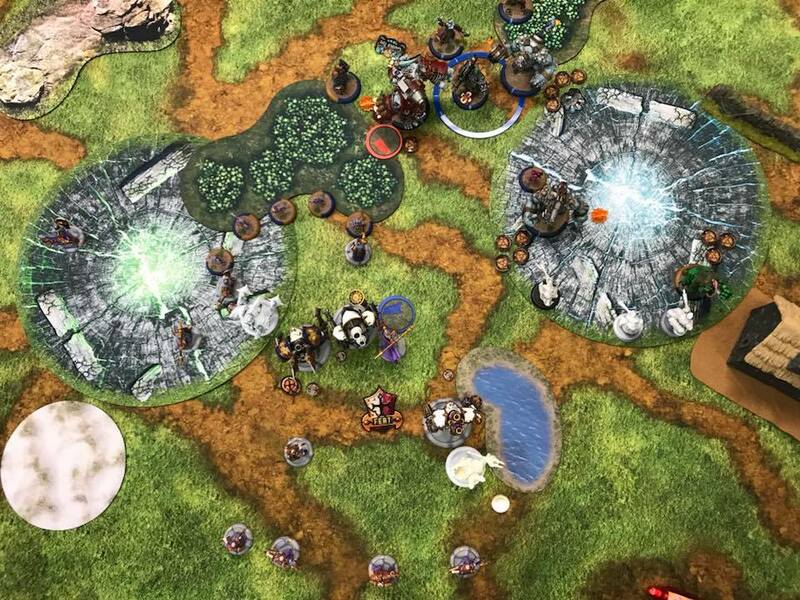 Sarge is joining in the Games Workshop Blood Bowl Tournament, and some of the other marines will be joining in the Warhammer 40K and Warmachine/ Hordes events. Good luck, everyone! I can't wait to hear how it went! In this segment, we'll be looking at projects that finally got finished, WIP's that I'm currently working on, and models that are getting ready to go. And today, I present to you 2 models. One is finally complete! 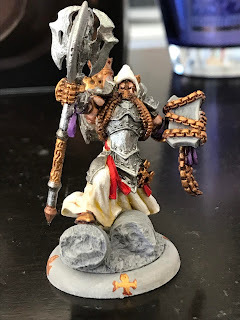 My first warcaster for the year, the Testament of Menoth is done! 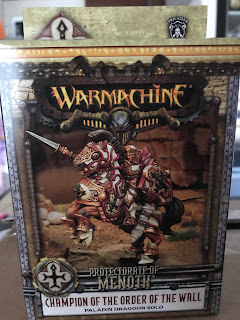 And the second model was just delivered to my door and is going to be getting put together and painted up ASAP, the PoM model from the 12 Factions of Christmas that Privateer Press put together for the holidays, the Champion of the Order of the Wall! Aw, yeah! He looks ready to shepherd some souls to Urcaen. I'm rather pleased with the way he came out. My new painting technique is coming along! 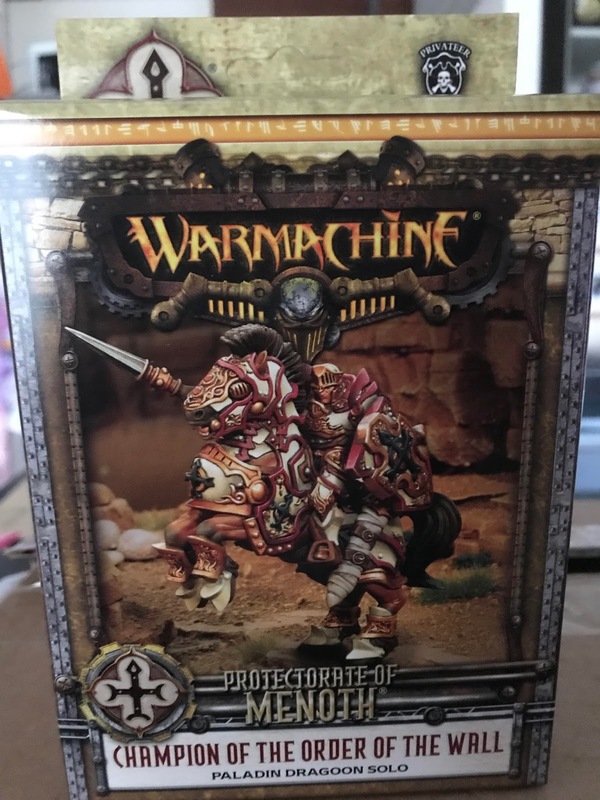 Fresh to my doorstep, the newest model for the Protectorate has arrived! 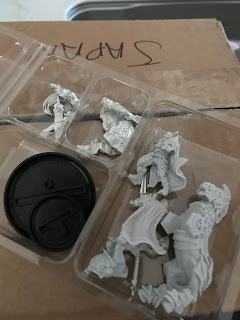 I can't wait to get started, and the model looks like a lot of fun to put together! This month, I was hoping to get a game in with Leland, but with this and that and some other things we didn't manage to face off against each other. 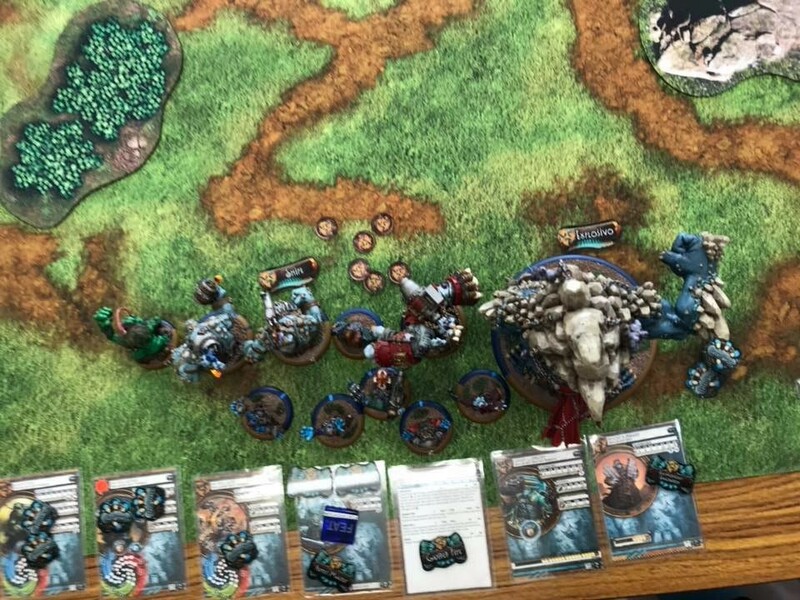 Next time, I'm really going to hope for a game against Cygnar! I did get two games in against two of DTB's Trollkin lists. Both times I used my list for Malekus, but was never really able to make it work the way it was supposed to. I'm hoping with a little more time, I'll get Malekus to be the super badass that I know he can be! Gunnbjorn came out guns blazing to try and take him down, but Malekus was not afraid! 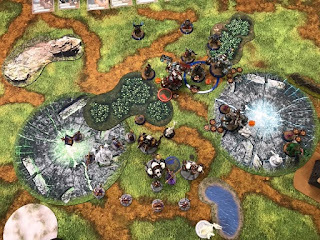 I used the Guardians of the Temple theme force, which means that my Temple Flameguard cannot be knocked down while in base to base, and a Daughter of the Flame unit gains Ambush... but, I didn't use a DoF unit in this list, so alas, that will go to waste! 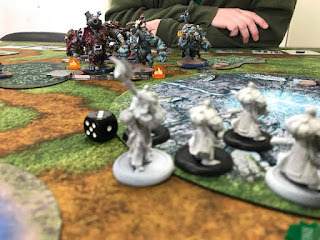 upkeep spells in play, so he put Explosivo on the Mountain King and Snipe on the Dire Troll Blitzer. Also due to the theme force, the Dhunian Knot can calm one beast per model (so, up to three) for 1 fury... wow! Good stuff! 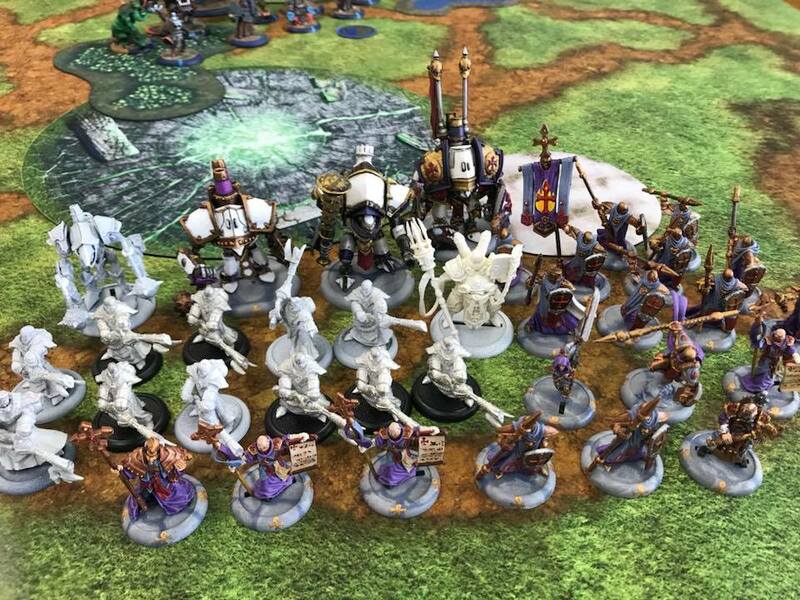 A force full of Menoth's might! Finally, Malekus is on the table! I've been looking forward to this for a long time! This is a Guardians of the Temple theme force, so as I mentioned a minute ago, Temple Flameguard can't be knocked down while in B2B and my non-existant Daughters of the Flame unit gains Ambush. 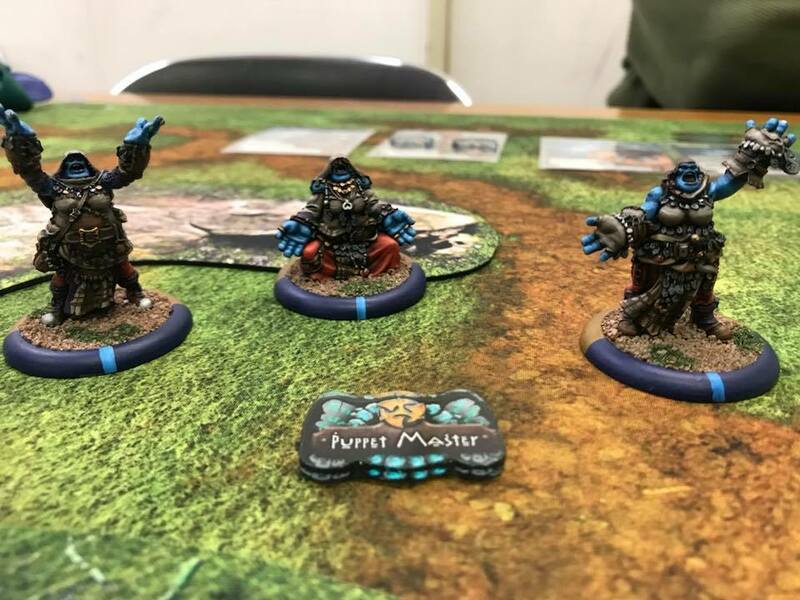 So, when you put a bunch of beasts in your list and only one unit, your setup is pretty compact! 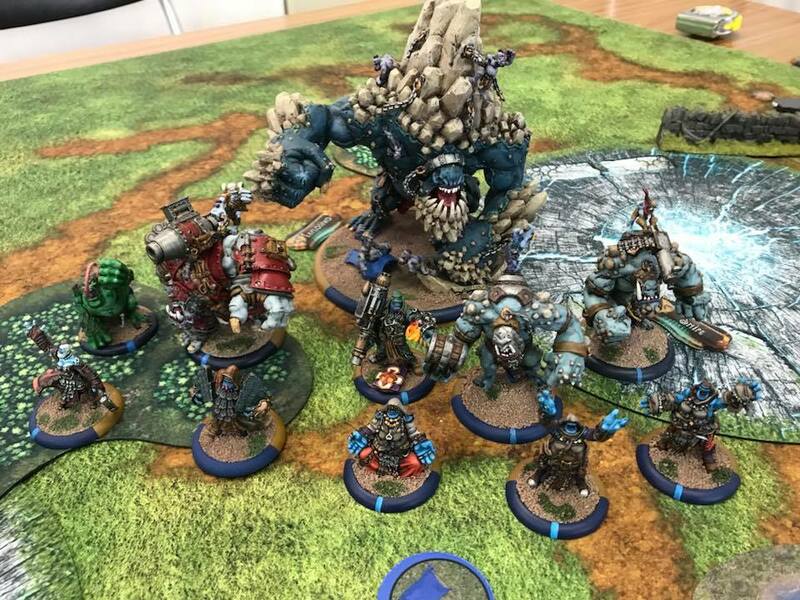 The front line had the Swamp Troll on the left, next to the Dire Troll Bomber, the Blitzer, the Runebearer, Dozer & Smigg, and the Mountain King on the right. Behind them, Gunnbjorn took the middle, with Janessa between him and the Mountain King and the Dhunian Knot spread out behind him. Alright...so, problem number one to winning this game was this set up. Do you see this? What the heck was I thinking??? 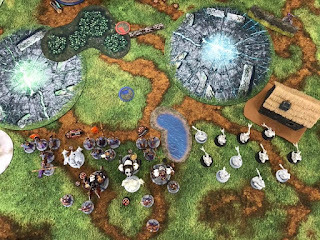 The Cleansers should have been in the middle, followed by a skirmish line of the Flameguard, with the 'jacks bringing up the rear. Did I do that? NO I DID NOT!!! Ugh. Instead, I came up with this master plan to spread my forces out as far as possible. 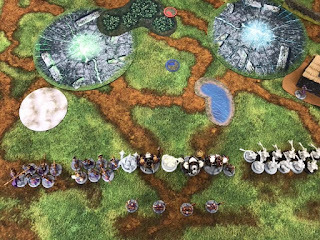 Temple Flameguard and Phyrrus on the left flank in two groups, starting the game in Shield Wall. 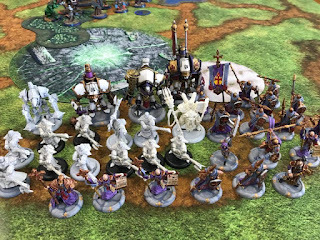 Next to them, the Purifier, the Eye of Truth, Malekus, the Reckoner and the Vanquisher, and the Mechanik in base to base with the Vanquisher. The Cleansers took the right flank, and the Choir spread out behind the jacks. Nicia set up at the corner of the cottage, ready to swoop in to kill some Troll! We rolled the Outlast scenario, which is not that great for DTB since it consists of two zones that can only be controlled by units. There are also two flags that can be held by solos and 'casters/ 'locks. Good for me, if I can keep his beasts out of the zones. 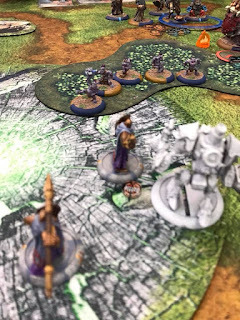 As the Protectorate tried to strengthen its boarders after the conclusion of the Northern Crusade, Malekus the Burning Truth was ordered to take a force of Flameguard along the Cygnar boarder. 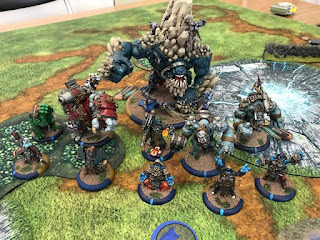 As they neared their destination, a force of Trollkin from the north appeared, intent on the same mission. The two forces appraised each other across the field for a moment before Malekus raised his sacred flamethrower and motioned his Cleansers to destroy the army of Dhunia. Trollsus (the Runebearer) moved up and put Harmonious Exaltation on Gunnbjorn. The Mountain King and Dozer & Smigg ran forward. Gunnbjorn moved up and made a rock wall next to the flag before casting Swarm on himself. The Blitzer, Bomber and Swamp Thing ran forward. Behind them, Janessa walked forward and made a hill for Gunnbjorn. Finally, the Knotts Berry Farm ran forward to be near the beasts. The Cleansers ran forward, followed by the amazingly speedy Nicia. The Flameguard also ran, getting into B2B to prepare for Shield Guard next round. Phyrrus followed them, also in B2B to activate his special ability to ignore normal damage while he is in B2B. The Purifier, Vanquisher and Reckoner ran forward. The Eye of Truth moved up, keeping one focus on himself just in case he needs to use Orracular Vision. The Choir moved up, giving Passage to the 'jacks, and the Mechanik ran up to stay in B2B. Malekus walked into base to base with the Eye of Truth and cast Ignite on the Flameguard. Gumbjorn upkept all three spells, leaving him with 3 fury. Yikes! That is not a lot! Luckily he has a Runebearer, who walked forward and gave him Harmonious Exaltation. Knott's Berry Farm spread out to cover as many beasts as possible and put Puppet Master on the Mountain King, Dozer, and the Blitzer. Swamp Thing ran towards the wall, and Gunnbjorn walked up after him and cast Guided Fire. I really hate that spell. DTB already rolls with unholy luck... he doesn't need a boost on every roll! And then the murder began. The Mountain King moved forward and killed 3 Flameguard. 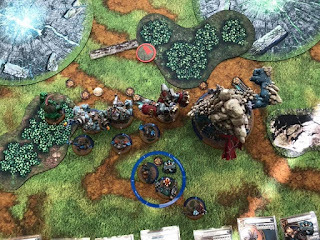 The Blitzer moved up to the wall as well and killed off a Cleanser and 2 Flameguard and Dozer killed another 2 Cleansers, right before the Bomber killed Nicia. Oof... I thought that her stealth would keep her safe... alas. I'm not gonna lie... I got a little frustrated at this point. 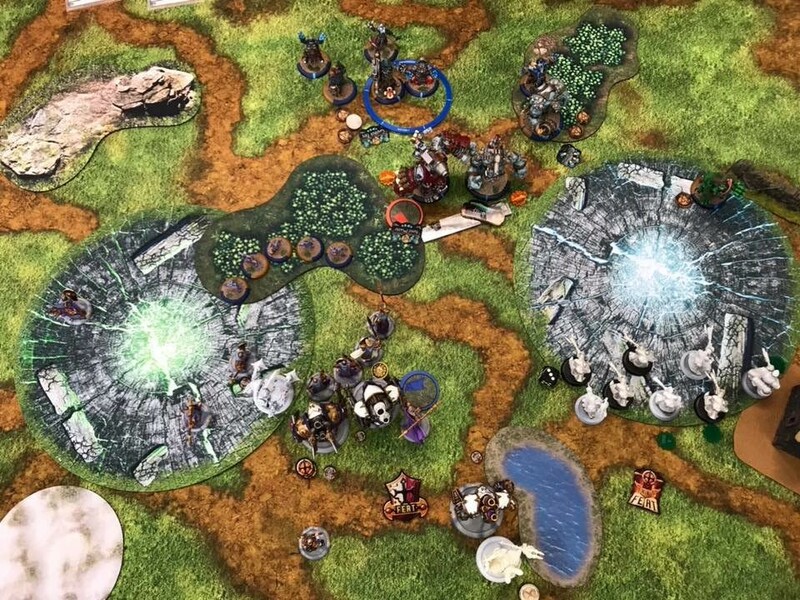 Nicia's death hit me pretty hard, and add to that the feeling like I really didn't know what I was doing with all the new models I've never played in my list, I wasn't having a great time... but that's when my Commissar training took over. Never retreat! Time to regroup and fight back. The Cleansers began by setting Dozer & Smigg on fire. Take that! The Flameguard charged the Mountain King and made a combined melee attack for 7 damage. The Vanquisher shot Dozer and the Blitzer doing no damage, but setting them both on fire as well. 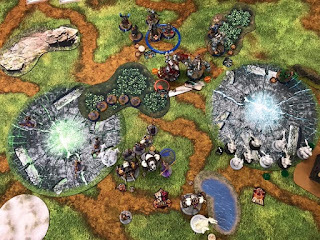 The Purifier charged the Mountain King (I'm going to KILL THAT GUY SO BAD!!!) doing another 9 damage... not too bad! 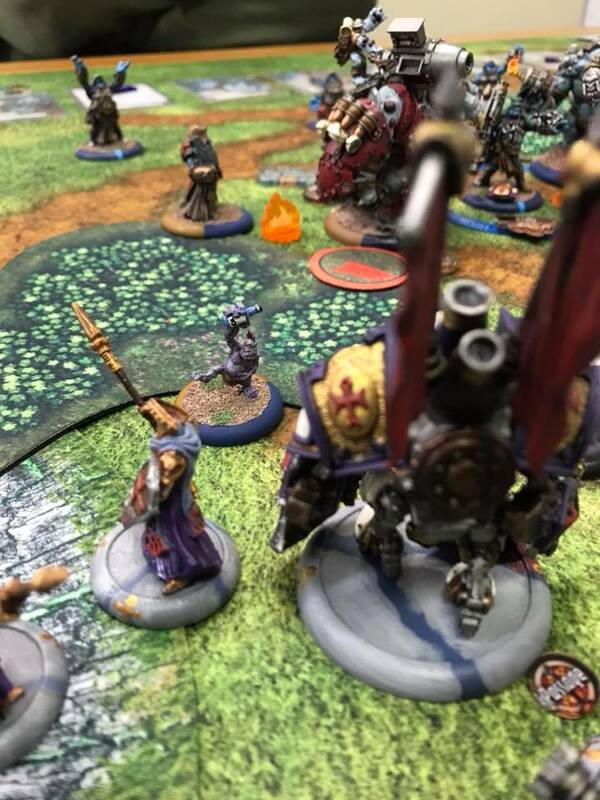 And, with the Purifier's special rules, setting the Mountain King on fire was a little bonus. Malekus moved up behind the Vanquisher and FEAT!!!! The Eye of Truth and the Reckoner double charged the Mountain King, finally killing it. VICTORY!!! Oh, wait... the game's still going... Phyrrus ran into B2B with the flag, and the Mechanik finished up by moving forward. And at the end of the turn, I took one CP for the central flag. First thing this turn, fire damage... mua-hahahaha! Thanks to Malekus' feat, it has no chance of going out, so now time to roll some damage! The Blitzer takes 5 and Dozer took 6. 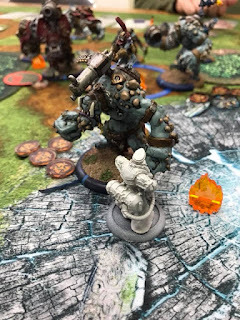 Then Trollsus moved forward, giving Harmonious Exaltation to Gunnbjorn. 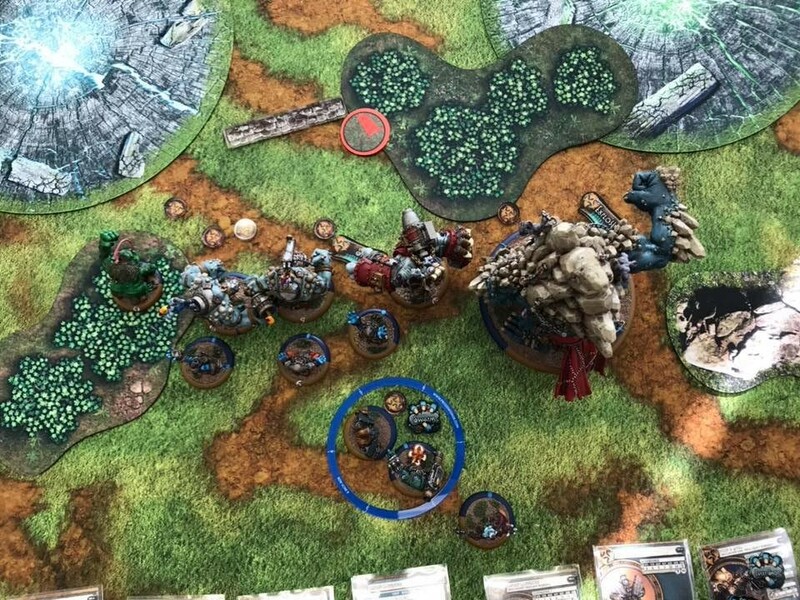 The Dhunian Knot moved up and put Puppet Master on all three heavy beasts, which the Blitzer promptly used as he moved forward and took a shot for 9 damage at Malekus. Swamp Thing charged the Cleansers, killing 2. Gunnbjorn cast Guided Fire again and Snipe on himself. Then he moved up and took some shots at Malekus for another 7 damage... eep! The Bomber put Far Strike on himself and threw two bombs, killing 2 Flameguard and the Officer and putting 2 damage on Phyrrus and breaking the gun on the Reckoner. Then the little Whelps ran around, trying to be annoying and getting in the way in my zone! And a second CP comes my way with Phyrrus still sitting on the flag. Time to win on scenerio! The Flameguard started the round by killing 2 Whelps. The Cleansers charged (with Assault!). 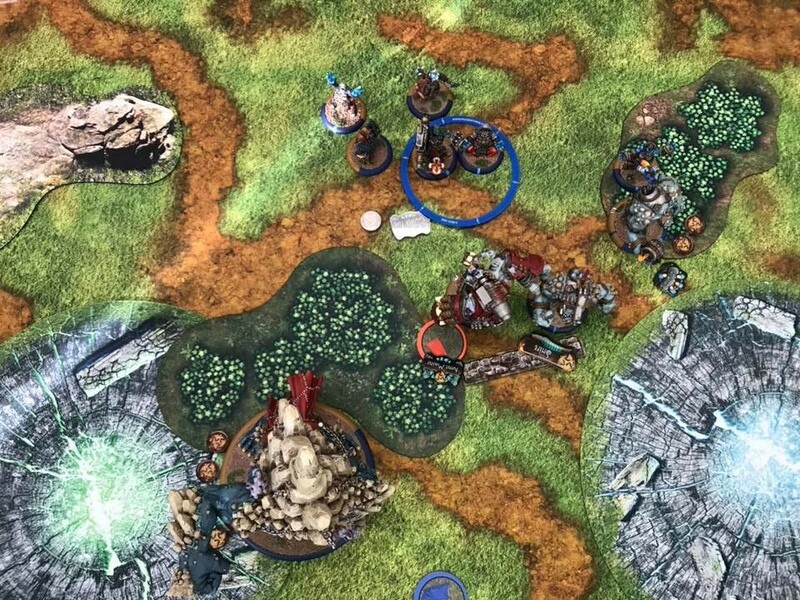 One killed one Whelp..another charged Swamp Thing... and a last one charged the Blitzer. The Purifier, ugh... I wanted to do something useful with him but I had to get that last irritating Whelp out of MY zone, so off he went to squish himself a mini-troll. Only one Whelp left on the board... the best of them all, the Party Whelp. I almost can't bring myself to kill him, he's so awesome! The Mechanik fixed 3 points on the Reckoner, fixing his gun just in time for him to shoot with it. And shoot he did, slamming Gunnbjorn for 2 damage. The Vanquisher followed, shooting Gunnbjorn as well and dealing another 6 damage! The Eye of Truth readied his massive Eye Beam, aimed at Gunnbjorn and BEEBEEBEEBEEB! Time up! MVP for today totally goes to the Dhunian Knot! The Puppet Master was so important for DTB, his already suspiciously good rolls becoming oh so close to 100%! He never even used the theme force benefit for removing fury, Puppet Master was so good! Good game, DTB! I look forward to another game against the blue horde, but next time, I'm going to win! See everyone on February 11th!